The Arena Players Gallery & Exhibition Space, 801 McCulloh Street, is now showing its latest exhibition, Storypiece: Documentary Story Quilts of Dr. Joan M. E.
As a retired educator with 44 years of teaching experience, from Maryland Public Schools and Maryland Institute College of Art (MICA), Dr. Gaither continues to hold quilting workshops with increasing collaborative involvement from multiple communities as the stories unfold. Gaither’s sense of urgency and passion encourages community members to capture oralhistories and memories from the aging storytellers in the community and preserve them in quilt formats to live on as human American stories for generations to come. 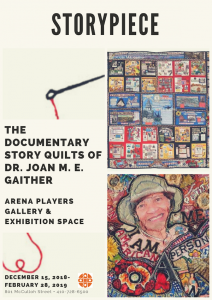 In conjunction with the Storypiece exhibition, the Arena Players Gallery will host a reception and artist talk with Dr. Gaither at 1:30 PM January 13th, 2019 and a Documentary Quilt Workshop to be announced.Gaither’s quilts have recently been shown at Baltimore’s Reginald F. Lewis Museum and the Bates Legacy Center in Annapolis. Her works speak to a place in many communities—telling one’s own story, telling the stories of others, and finally, helping others to find and tell their ownstories within the context of one shared collective history. 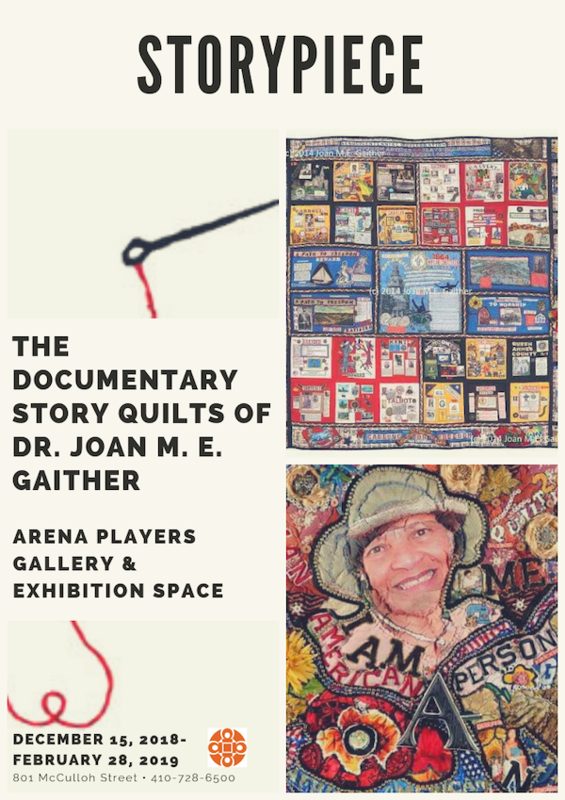 Storypiece: Documentary Story Quilts of Joan Gaither is open to the public December 15th, 2018 through February 28th, 2019. Call 410-728-6500 for gallery hours. Arena Players Gallery & Exhibition Space 801 McCulloh St.
GOD bless at last !!! Dr. GAITHER, taught art at Western High School in Baltimore , M.D. I remember her as an inspiring, approachable, talented teacher. Quilts are all a work of love and compassion. Plan to attend on Sunday, January 13. So excited! I will be there! Looking forward to seeing you! Awesome. I just returned back to the hotel. Great to see this.